Last week was national Breakfast week but oops I missed it. I'm so sorry about that but us mums know that Nestle cereals are for life, not just for national breakfast week. Breakfast time here in the Mummy Of 3 Diaries household is a little bit crazy and noisy but always fun and sort of healthy. There's always a choice of cereals for them to choose from or some toast if they fancy something different. I'm a toast girl myself but my kiddies tend to go for a cereal to start their day. Last week we were sent a wonderful selection of Nestle Cereals so that we could join in the breakfast week celebrations, which we did (I just forgot to write about it). Each of us has our own favourites so I'll start, eldest first which means me of course. I loved the Cheerios the best as they're made with 4 whole grains, 8 vitamins & iron and calcium and taste great with a splash of cold milk. Daddy who's on a fitness diet loved the Shreddies as they're full of whole grain wheat goodness and come in handy bite size pieces which make them great for people in a hurry like he is. Chloe enjoyed the Cheerios like myself. They're simple yet tasty and full of fun. Those little hoops of yumminess are the perfect way to start our busy days. 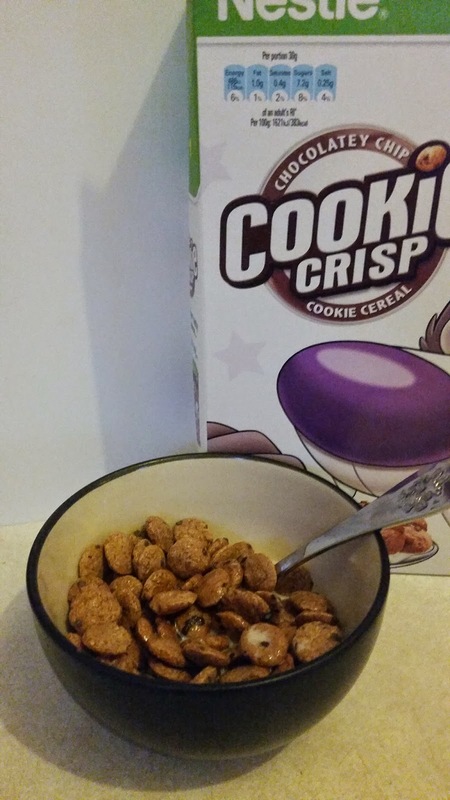 My youngest two Lily and Ryan were obsessed with the Cookie Crisp. I think the fact that they look like little cookies makes them really popular with younger children. My kids feel like they're getting a treat before school whereas they're really getting the essential vitamins and minerals they need and it contains whole grain so it's a win win situation for us here. As part of national Breakfast Week Nestle ran a competition where they asked families to mix up their cereals to try and create something new. We missed the deadline to enter but I thought I'd still share what my little ones came up with anyway. Lily mixes her Cookie Crisps with some Cheerios and named them Cheerio Crisps. She covered them in cold milk and enjoyed every mouthful. Ryan mixed some Cookie Crisps with some Shreddies and covered them in warm milk. He named his creation Shreddie Crisps and also loved every bite. My youngest two really enjoyed being allowed to mix their cereals as it's not something i would normally allow. I guess the whole 'playing with food' rule takes over sometimes but I'm glad we did this time as it really brightened up our week. Who knew mixing your breakfast cereals could be so much fun and taste so good. Nestle has a wide choice of cereals to choose from, which is your families favourites? Disclosure: We were sent a selection of cereals to enjoy in return for an honest review/post.